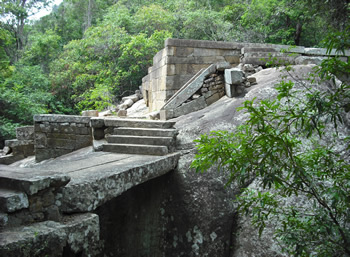 Ritigala ruins are situated in the Ritigala Strict Nature Reserve which out of only three strict nature reserves in Sri Lanka. Culture triangle project in Sri Lanka, included this place to their tourist ticket to the ancient cities and found just off the Anuradhapura-Habarana main road, 21 km off Habarana. 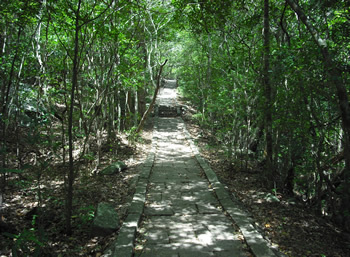 It 'is a partially excavated ruins of an extensive Buddhist Monastery located on a hill, standing prominent against the surrounding flat jungle. There are at least 70 caves at Ritigala which were prepared for monks between the 1st century BC. An inscription in one of these caves mentions that King Lanjatissa the brother of king Dutugamunu (B.C.161-137) gifted it and he probably founded the first monastery at Ritigala. The monastery was abandoned following invasions in 10th and 11th and was rediscovered by the British in the 19th century. The name Ritigala has a meaning of 'Safety-rock' and describes as a place of refuge. Many Kings from the 4th century BC, have used it for the purpose. The Ritigala mountain is 2,513 feet above sea level, three miles long and lies in a north-south direction. It is the highest mountain in northern Sri Lanka. In the rainy season its summit is often shrouded in mist and cloud and become watershed of the Malwatu Oya (river) which gives water to Anuradhapura, the river of first Sri Lankan civilization. 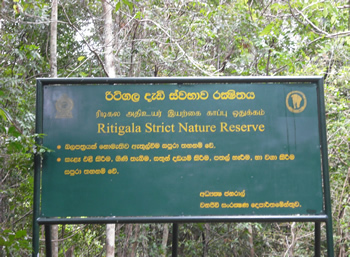 As many as 410 taxa of lower and higher plants are recorded from Ritigla mountain. Of which over 50% are medicinally important. 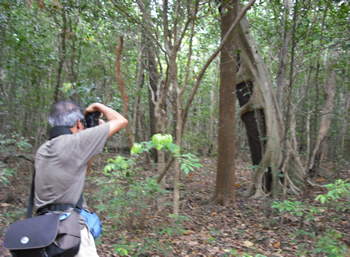 One new species Madhuca clavata, Coleus elongatus and Thunbergia fragrans var-parviflora are endemic to Ritigala itself. Ritigala is also rich in endemic bird species, including Sri Lanka Gray Hornbill, Sri Lanka Spur Fowl, Sri Lanka Jungle Fowl and other wildlife's includes elephants, sloth bear and even leopard. 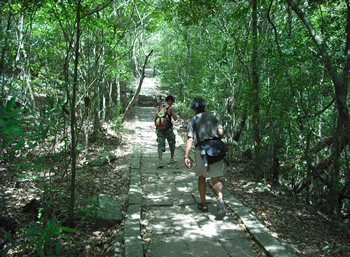 It is reachable by a jungle track. Leading up from the entrance the first place is a bathing pool call Banda Pokuna. In one corner of the pool is a natural spring, Up a rocky ledge, you reach what was once a gateway and a still-intact, stone-slab bridge leading to a long staircase through the jungle. At the top of the staircase you reach a collection of excavated buildings. 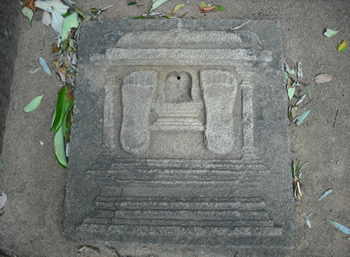 But contrary to other Buddhist sites, Ritigala has none of the usual icons like, relic house, Buddha images or a Bodhi tree. The monastery, which contains a remarkably undamaged urinal, a hospital, complete with stone bed, oil-bath and medicine grinders and along another jungle path, the remains of a library.